The Black Motion F5 Dock is a full-featured, desktop docking station. 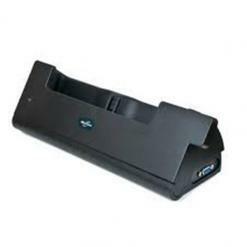 The F5 Dock features external ports to support an external VGA display, RJ45 connectivity and additional USB accessories such as a full-sized keyboard, mouse and printer. The Docking Station includes a charging bay to charge an additional battery which can be hot swapped while the unit is docked. The Dock also has a universal lock slot for added security. AC power Pak included.